The green dill leaves are feathery and soft. The leaves and seeds are flavorful seasonings (often used in making pickles). Dried dill leaves are commonly known as dill weed..... 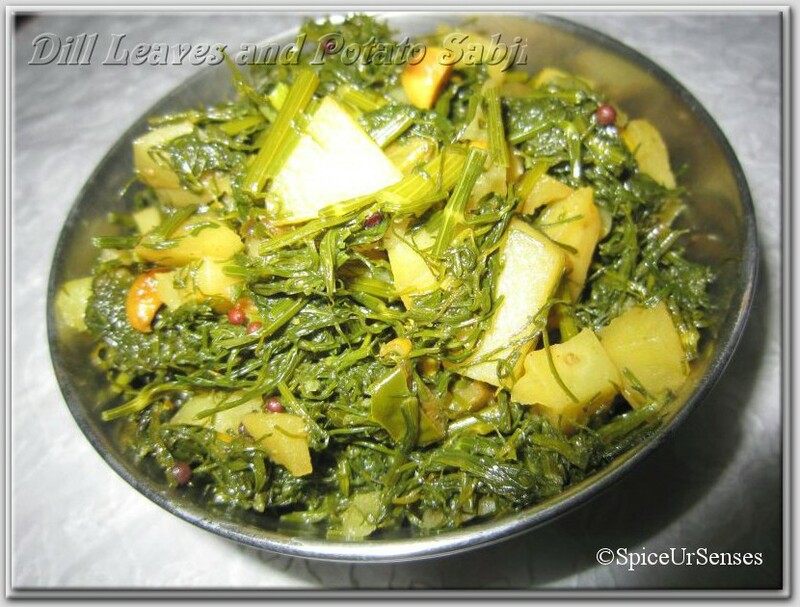 This recipe is one of the very simple recipe to cook in a lesser time..
Add turmeric, dill leaves, potato and salt, mix it well and cook for 10 to 15 minutes, in a medium flame. Looks very healthy and delicious, nice subzi. I haven't tried cooking potatoes with dill...looks tempting! Thats a different one.. New to me.. But love the looks.. Very nice dish, I love Dil, but never tried with Potato ...and garlic..will be great I am sure. Simple yet tasty but I never used dill in my cooking though..
That must be really tasty with the dill! oh..love to try that... looks really great.. have something for you..
never tried dill with potatoes...very healthy and tempting dish..! Thanks for comment. You should give a try and let me know how did it go..Thanks for sharing info, i will see it.